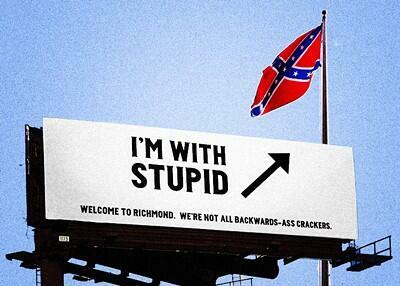 You get credit, Richmond, when you take down those statues on Monument Ave. Except Arthur Ashe. He can stay. After I heard about the horrific church shooting in Charleston on June 17, I have to say that the last thing I would have predicted is a wholesale, bipartisan war on the Confederate flag. I expected the brief, heart-wrenching, and futile discussion of gun control; I expected the calls for a “national conversation about race” (whatever that means); and I expected the general sense of self-congratulation that Americans now at least express sadness in moment of racial terrorism. But I didn’t expect such a wholesale revisiting of the politics of the stars and bars. And I definitely didn’t expect that revisiting to be happening among members of the Southern right. Politics are an unpredictable beast. Not hard to grasp what’s going on here. 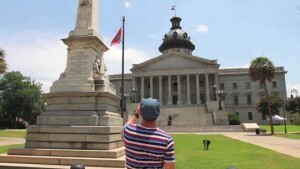 As far as I can tell, the Confederate flag got on the agenda because of the a very specific set of coincidences: South Carolina’s legally mandated confederate shrine on the state capitol grounds combined with the fact that one of the victims, Clementa Pinckney, was a state senator whose desk was draped in black in the aftermath of the tragedy. These two circumstances created a near-perfect photo pop for the media; Pinckney’s desk juxtaposed against the Confederate flag, or the U.S. and S.C. flags flying at half mast in the background behind the stars and bars, still flying high. The image was irresistible because it captured the “difficult national conversation about race” in one easy frame whose symbolism packed all the wallop and subtlety of a Bakken oil train. A “national conversation about race” is emotionally and politically fraught; this widely-circulated picture may be many things, but difficult to understand it is not. The political assault on the flag has metastasized (here’s a current list of governments and corporations who have moved against it), and has grown to include calls for the removal of Jefferson Davis from the Kentucky state capitol and Robert E. Lee from a prominent traffic circle in New Orleans. This is good. I can only hope the momentum continues until they rename Jefferson Davis Highway in Fredericksburg, which embarrasses me as an American every time I have to drive on it. One of the more prominent reactions to this news from the left seems to be disappointment, that all this political energy is focused on a mere symbol of racism, rather than racism’s reality. “Taking Down the Flag Isn’t Enough” is a common sentiment of editorials calling for gun control, expanding Medicaid, dismantling the war on drugs, and generally confronting racism. And I can’t disagree with the argument; removing the flag from the capitol grounds and the shelves of Wal-Mart will have essentially no measurably immediate effect on the lives of African-Americans in South Carolina and beyond. But I think it’s important to remember: removing the Confederate flag and other Confederate symbols from public display is not nothing. Sure, it’s symbolic, but as historians we should recognize how incredibly important and powerful symbols can be. The communicative power of simple, direct symbols are why we are having the conversation in the first place: as I said above, the power of the image of the stars and bars flying high at the capitol in the days after the massacre means that we are actually talking about race (however symbolically) in the aftermath. And removing Confederate iconography sends an equally important symbolic message: overt defenses of white supremacy are now beyond the bounds of acceptable political sentiment. This has not been the case, even recently. So a national, bipartisan consensus that the iconography of the Confederacy is fundamentally white supremacist and has no place in mainstream politics represents very real progress. I’m skeptical of easy comparisons between the civil rights struggles of African-Americans and gays, but I think there’s an instructive parallel here. I would argue that one of the reasons we have seen such rapid change in public sentiment about the legitimacy of homosexuality is that overtly homophobic speech was increasingly judged out of bounds over the course of the past decade. Especially in the Obama era, anti-gay political sentiment increasingly had to be wrapped in a cloaking language because overt straight supremacy became a mark of backwardness, parochiality, or at the very least impoliteness. I don’t know that this silencing actually changed any minds, but it did create space in the public sphere for pro-gay rights arguments to take root and begin to flourish. It strikes me that the current war on the Confederate flag could serve a similarly important role. Sure, it’s not going to change the material realities of life for African-Americans today or tomorrow, but by shifting the boundaries of acceptable political sentiment–particularly on the right–it lays the groundwork for a new generation of arguments about substantive political change and gives them at least a little bit of breathing room to becoming broadly persuasive. I’m with World of Pancakes. Lasting change comes in baby steps. Removing this symbol of hate is a huge baby step! Let’s keep going.